Clear recent files list - tap this to clear the list of recently opened files in the lower pane of the document picker window. Disconnect cloud drive - select a cloud drive to disconnect, the drive will no longer appear in the list of available drives in the document picker window. "Hold to select" delay - this is the delay between the mouse click or tap, and the item you are selecting becoming active. You can shorten or lengthen this delay by adjusting the slider. So if for example you find yourself 'throwing' the page when you actually want to select some text with a click and a drag, then you'll find that if you reduce the delay this won't happen. 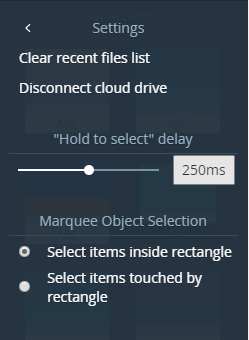 Marquee Object Selection - clicking and dragging around objects to select them, known as marquee selection, can be modified to select items either touched by the marquee rectangle or enclosed within the rectangle.